One year, I didn’t make them because they hadn’t eaten much of them the two times prior, and I thought there was going to be a revolt! It was like anarchy when the kids realized these cinnamon rolls were not in the oven, waiting on them to finish unwrapping presents. 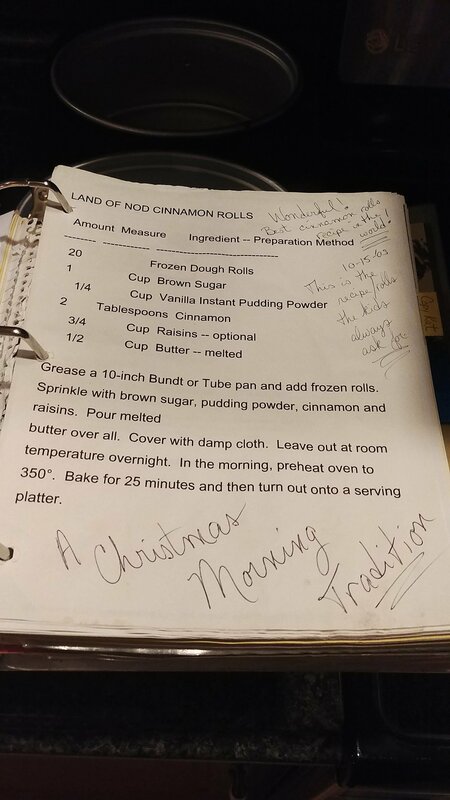 Now it’s one of those things that I hear about every single year on Christmas Eve: “Remember the time you forgot to make the cinnamon rolls, Mom? You remembered to get the stuff again for this year, right?” I’ve never forgotten again. Make sure you only fill your pan halfway with the dough. It needs room to rise, and a shallow pan allows the topping to slide off! Also, don’t substitute margarine. Use REAL BUTTER! These are ooey gooey cinnamon rolls, and they’re sure to be a hit at any gathering! Merry Christmas from all of us at Striving Acres Farm! Just saw this, and I definitely remember the time you forgot the cinnamon rolls. Devastating. Never again.